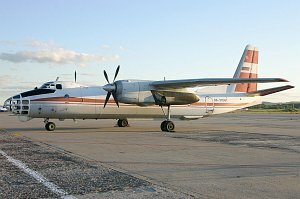 The Antonov An-30 is a twin-engined photographic / survey aircraft by the Soviet design bureau OKB Antonov (today Antonov ASTC, Ukraine). The An-30 is a development of the Antonov An-24. The An-30 is equipped with an additional turbojet engine Tumanski RU-19A-30 with 8,8 kN (1978 lbf) thrust.